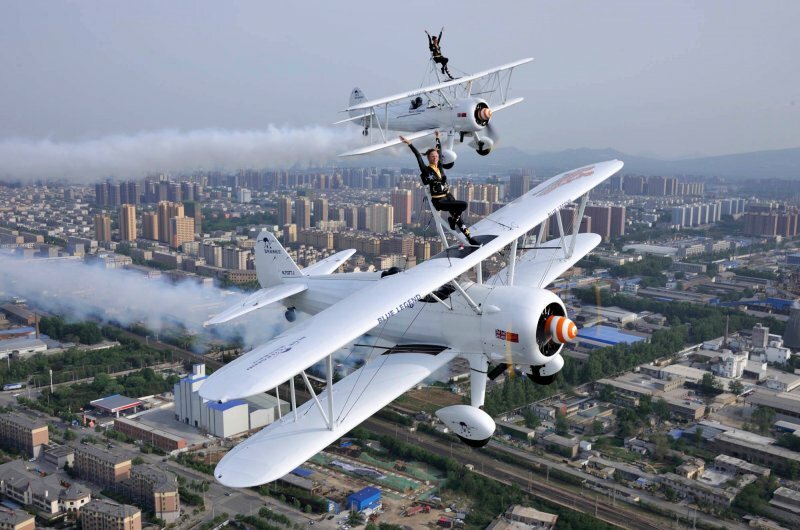 The Global Stars are one of China’s most popular aerobatic teams of all time since 2011. The team first visit Dazu in 2011 and have been returning to China most years since then. This is the second visit in 2018 with a 3rd on the cards later on in the year. 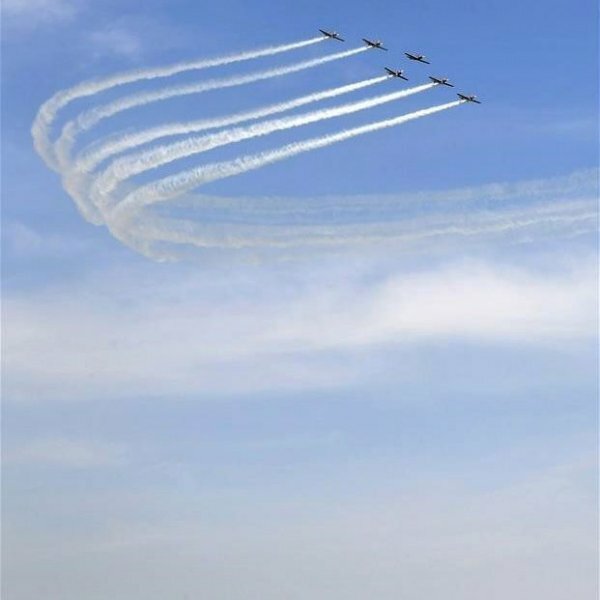 The Air Show at Zhengzhou starts on the 27th April till 1st May. The pilots on this occasion Mark Jefferies, team and formation leader, Steve Carver left-wing, Chris Heames right-wing and reserve formation leader and Chris Burkett in box. Engineers Arunas Monkevicius, Neil France, Chris Jones and Tom Bootyman. 28th April – 1st May. All the show days go as planned. Daily the flight order changes. 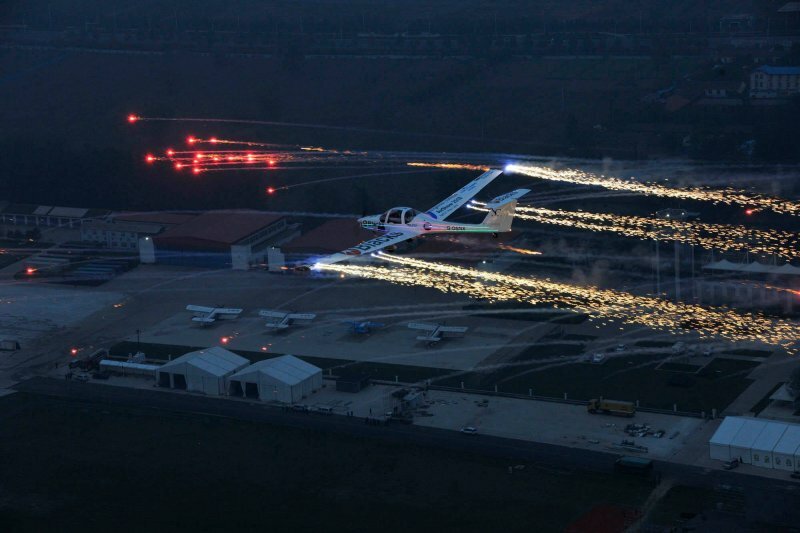 The Global Stars fly formation slots 3 times a day, Morning, afternoon and pyro in the evening. Thrown into that I also have to fly a solo. With the practice flights thats 26 formation flights and 6 solo flights. During the event there were 85 displays flights, some teams only flew twice. The Pioneer team fly very well with the Rotax powered machines. The use of coloured smoke and pyro is nice. 27th April. Show day 🙂 We start of with a mass flyby, RAF term a “gorilla”. After which the teams fly there routines. The afternoon session I fly a solo. Between the overseas teams the local displays teams strut there stuff. Parachutists, Paramotors, gyrocopters and a pair of ultralites fly a very nice formation. The evening show waits till dusk. Pioneers, Global Stars and Aerosparkx. a few pictures below, we are using “local” pyros and unfortunately the electric matches have quite a high failure rate so we will use 2 in each next time to alleviate the problem. ANBO team from Lithuania flying 3 x YAK’s have been practicing hard and fly a very tight show. Pictures in a later posting. Jez Hopkinson has whipped his boys nicely into shape with the Yakovlevz producing a nice steady formation with lots of presence. 26th April. Civil Aviation Authority China have been taking statements from key personnel regarding the accident. After which we continue flights at 12:00. The Global Stars do one long mission and then have lunch resting till the evening pyro practice. 25th April. We are now starting to get a routine. Practice times allocated and then we are ready on slot only to be told, 10 mins delay which turns to 15 and then 20…. Most annoying. All teams fly twice. Elgin Wells has been assembling his aircraft for 2 days sorting various minor issues. Finally he’s ready and take a slot towards the end of the day. With sadness to say this is his last flight. The Chinese press release follows. 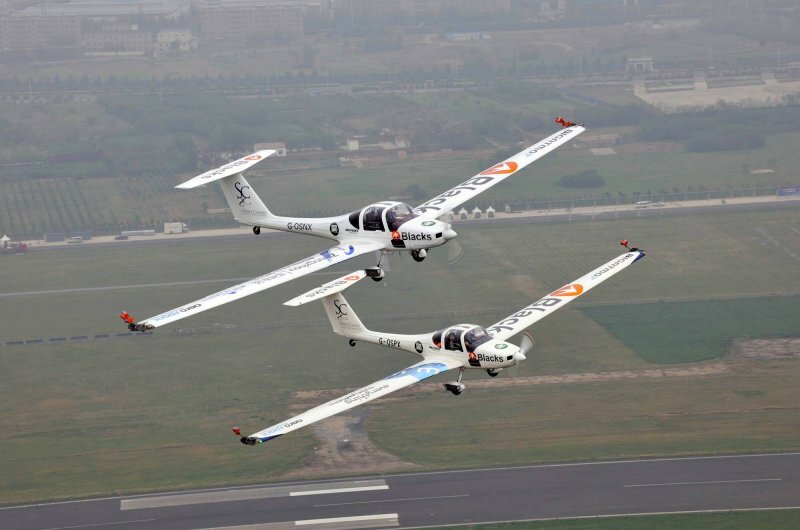 ZHENGZHOU, April 25 (Xinhua)– A U.S. pilot was killed after his aerobatic aircraft crashed during a trial flight ahead of a local air show at an airport in the central Chinese city of Zhengzhou on Wednesday, according to local authorities. 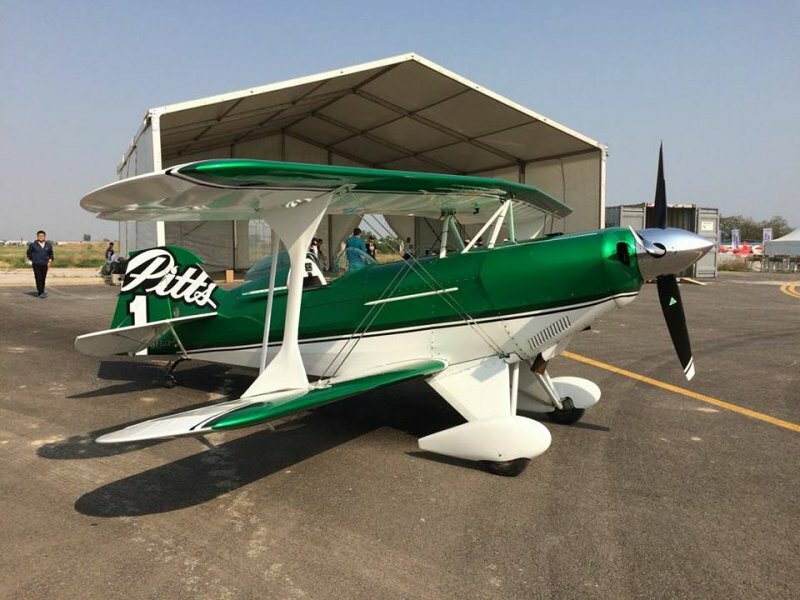 Elgin Wells, a pilot of the U.S. Red Eagle aerobatic flight team, died in the crash after his aerobatic plane Starjammer plummeted to the ground at about 6:14 p.m. from around 100 meters above the airport runway at the Shangjie Airport, the air show organizer confirmed. The crash caused no other casualties on the ground. An investigation into the cause of the crash is under way. 24th April. Today is check flight day. Not unexpected but with 15 mins to go there is a delay of 1 hour added, however we fly on the allotted new time for 30 mins mission. Individual take-off, short handling checks then join up for warm up figures from the sequence. All goes well. Why is it that we just get lunch delivered and the fuel truck appears again :/ The second flight we fly the full sequence all to plan. Then luckily as not all teams on site yet we get a 3rd flight. 23rd April. We take an earlier bus with the small amount of work to do. Ground runs on a small amount of residual fuel then wait for the fuel truck to appear, this is did at the same time as lunch. A glimmer of hope was “maybe” at 15:30 you will know if you can fly after 5.. we wait, we wait and wait. No flying. Still we are promised first slot when the military say we can fly. 22nd April. Being fair to the team I suggest bus at 10am for the a/p, no resistance was meet 🙂 Containers opened by 10:30 to find all strapping as tight as the day it departed UK. All aircraft and tooling unloaded to commence build. This goes very well. We stop work at 13:00 for a well-earned break, pizza was supplied. Very nice for the team but I can’t eat wheat product so have a chinese. By the end of the day 2 a/c are completed with just 2 hrs remaining to have a quartet. Fuel as last occasion needs planning well in advance. ATC needs even more planning with 24 hours notice, this was a matter that we missed until too late, so unfortunately all we can do is 2 hrs of work tomorrow. A selection of “as its happening” pics below. 20th April/ 21st April. The team makes its way to LHR to catch a Cathay Pacific flight to HK on a Boeing 777. The flight was uneventful with a good service on time. We now have a 5 hrs wait for the flight into Zhengzhou. The remaining flight happens. No q’s at immigration but a long wait in an empty baggage hall for bag then onto a mini bus for the last 1.5 hrs to the hotel. Supper was a sort of pub affair, BBQ lamb and beer! Approx 35 hrs from bed to bed.